For proportional control of pneumatic valves and damper actuators in heating and air-conditioning systems. 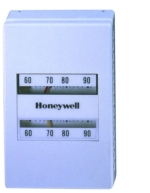 The TP970 incorporates a relay amplifier giving sensitive control and facilitating averaging control, which requires extra relays when bleed-type thermostats are used. The range comprises factory calibrated bimetal element proportional instruments with a setpoint indicator. The cover is ordered separately, and restrictors are not required.